5.45x39 ammo is perfectly paired with the AK-74 rifle and is now used across Eastern Europe and Russia in service firearms. A light-weight and high velocity caliber, 5.45x39 rounds offer exceptional muzzle velocity and allow military members to carry more ammunition than larger (and slower) calibers. Engineers in the former Soviet Union developed 5.45x39mm as a caliber in the 1970’s. The original military issued round was called “5N7” and featured a full metal jacket (FMJ) along with a gliding metal-clad jacket and boat-tail projectile for stability. 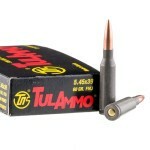 5.45x39 is still extremely popular today as an evolution of the AK-47’s 7.62x39 cartridge. Militaries and militants fired the steel-core version of this round (known by the designation "7N6") during the Afghan War, Yugoslav Wars, The Georgian Civil War and other conflicts around the former Soviet Union. In April 2014, the Bureau of Alcohol, Tobacco, and Firearms classified the 5.45x39 7N6 cartridge as armor piercing ammunition, which led to a ban on military surplus importation into the United States. 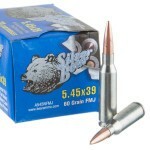 So what’s to love about 5.45x39 that you can’t get from what the American and NATO boys are firing out of their M16’s? Well, less recoil is the big thing. The AK-74 has tested with a recoil energy of 3.39 Joules (2.5 foot-pounds), about half of what the M16 delivers firing 5.56 ammunition. 5.45x39 ammo comes in an assortment of different bullet weights today ranging from the 49 grain light-weight round to a heavier and subsonic 80 grain “7U1” subsonic round. Muzzle velocities of course relate directly to the bullet weight but can be as high as 3,000 feet per second for the 49 grain bullet to 990 feet per second for the subsonic load. Today, most 5.45x39mm ammo you’ll find for sale in the United States is manufactured primarily in Russia, Ukraine, and Uzbekistan and Romania. For instance, the WPA Military Classic line of bulk 5.45x39 ammo is manufactured by Wolf at the Barnaul Munitions Plant in Russia.